Is there really a “superpowered secret” to getting kids to eat more fresh vegetables? Apparently CNN thinks so (“The superpowered secret to get kids to eat veggies”); so does CBS News (“A clever way to get kids to eat their vegetables”) . Would you be shocked to learn that these major media outlets got it wrong? Those headlines refer to a study on marketing to kids, just released by the Cornell Food and Brand Lab. The promotion for the study implies that all it takes to get more vegetables into kids’ diets is the use of branded cartoon characters in the school lunch line. 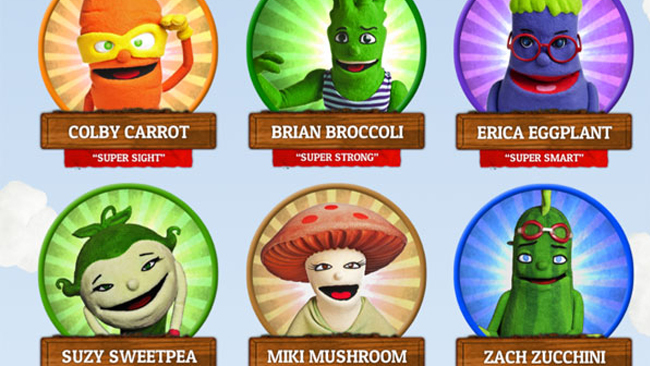 Researchers observed how many students served themselves from the salad bar with and without the use of produce-pushing characters like Brian Broccoli, on banners and in videos displayed right in the cafeteria. The study posts some eye-popping numbers. “In schools where videos were shown on TV monitors in addition to the banners, 239% more students selected vegetables from the salad bar!” says the Cornell Lab’s promotion. Have these researchers found the low cost, low effort silver bullet to getting kids to eat their broccoli? Not exactly. CNN claims that the study shows “Branded marketing tactics — from banners to commercials — nearly triple the likelihood of a child choosing to eat vegetables at lunch,” but that’s not really accurate. The research does not show that any more kids ate veggies when exposed to the “branded marketing”, but rather that more kids chose to put those items on their lunch tray. Putting food on your plate is a whole lot different than actually eating it, as anyone who has ever visited a Las Vegas casino buffet can attest. Research showing more kids “choosing to eat” the marketed veggies would require what is called a “plate waste” study, where the amount of food kids put on their tray is measured, and then the amount they throw away at the end is measured, to determine how much was actually eaten. That’s not what happened here. School food service professionals have observed many reasons why kids who take veggies may not ultimately end up eating them. The Kids’ Safe and Healthful Foods Project spoke with some of these pros, who identified reasons such as fiber-rich produce taking longer to eat than quick-chew mush like chicken nuggets. Other reasons include too short lunch periods, kids preferring to chat with friends rather than eat, or kids not being as hungry as they thought when they chose the food. First graders with missing front teeth may have trouble biting into raw veggies like carrots, while those whose permanent molars are emerging may not want to chew much at all. It’s not much of a stretch to imagine that a child who was convinced by hard sell marketing to put broccoli on her plate might find, once seated, that she doesn’t really want to eat the broccoli after all. In fact, “taking” is just one step in the chain of events to getting kids to willingly consume more produce. But it’s easy to see how some reporters made that mistake, especially when they don’t have time to read through the whole study, relying instead on a brief summary and the promotional materials for the study itself, both thoughtfully provided by Cornell Food and Brand Lab. Call me crazy, but the repeated use of the phrase “to eat” makes me assume that the study results will be about what kids, you know, ate. Not about what they put on their plate. Still, kids choosing to take fresh produce has to be seen as a good first step toward consumption by anyone who cares about kids’ health. Does that mean we should all be happy that Cornell’s marketing tricks had some effect? The issue of whether or not it is okay to market “healthy” food to kids using cartoon characters or other junk food marketing techniques has been hotly debated for years, including right here in Beyond Chron. In September 2014, Bettina Elias Siegel presented the pros of the issue, while Casey Hinds countered with the cons. “The developmental vulnerabilities of children, along with the legal, ethical, and political pitfalls of encouraging the food industry to target kids, make marketing food to children harmful regardless of nutritional content…. Unlike adults, young children do not have the cognitive capacity to fully understand the purpose of advertising. Very young children cannot even distinguish between a TV program and a commercial. Until the age of about eight, they don’t really understand the concept of selling and they tend to believe what they see. As the study used Super Sprowtz materials to market the veggies, presumably a positive outcome for the study will be a positive outcome for both Super Sprowtz and Founders Farm, in addition to garnering positive media attention (leading perhaps to more grants, contracts, and gifts to the Lab) for Cornell Food and Brand Labs. “Taking vegetables is not the same as eating them, and the plate waste needs to be checked by investigators independent of funding source. Otherwise, this appears to be yet another sponsored study with results favorable to the sponsor’s interest—whether the result of conscious or unconscious bias, we are unlikely to know.